The Pew Research Center for the People and the Press has published the results of its latest survey on news consumption and related topics. The content on search engines and social media gets a little lost among all the stats and charts so I thought I’d summarize that data here. 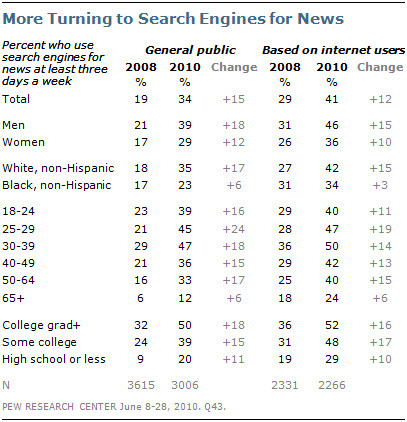 34% of the public now use search engines to find news at least three days a week, up from 19% in 2008. Yahoo and Google were among the most frequently mentioned websites for online news, indicating that users see them as sources for news (be it original reporting or aggregation) and not just search vehicles. 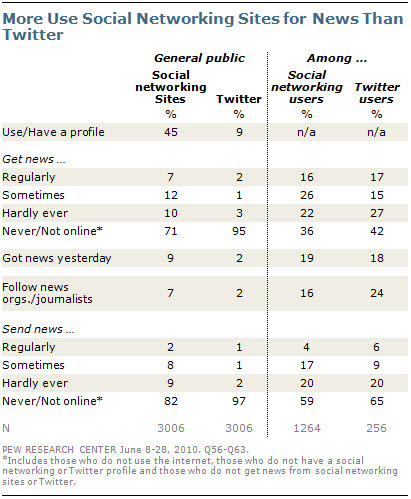 19% of the public regularly (7%) or sometimes (12%) get news or news headlines through social networking sites. Only 3% regularly or sometimes gets news from Twitter. 24% of Twitter users follow news organizations or individual journalists, compared with 16% of social networking users. Among social network and Twitter users, fewer share news than receive it. 21% of social networking users regularly (4%) or sometimes (17%) share news. 15% of Twitter users regularly (6%) or sometimes (9%) share news. For the full findings on search engines and social media see section two of the Pew report.